Themed parties can go way long as you can think..anything and everything can become the theme of your party. Again, things go different when the themed parties are for people of different age groups & different occasions. What kids love the most is something from the fictional or adventurous world. There are many superheroes introduced to the little kids through television, games and internet. One of them makes way into the kid’s favorites based on what they prefer. Kids would love it the most if their favorite characters are brought home and into their parties. This would make the party memorable for both the kids and the parents. Also, the kids would love showing off their superhero avatar to their friends. One such favorite character of the kids is the legendary Spiderman! The human with extraordinary powers and spider-like abilities is what many kids dream to be. The geeky high school kid Peter Parker, who gets extraordinary powers after a radioactive spider bites him, gets to transform himself into the amazing superhero and fight the evil. Just like many other superheroes, the Spiderman also has a dedicated costume & special powers. The unique webbed red & blue costume and mask of the Spiderman hides the childlike face of the little boy and keeps his identity hidden from the world. His unique ability to stick to the walls and build up spider webs makes him different from other superheroes. A Spiderman theme party is a sure winner among young boys. We, at WarmOven, have an enormous range of options to enable you to make the right choice. 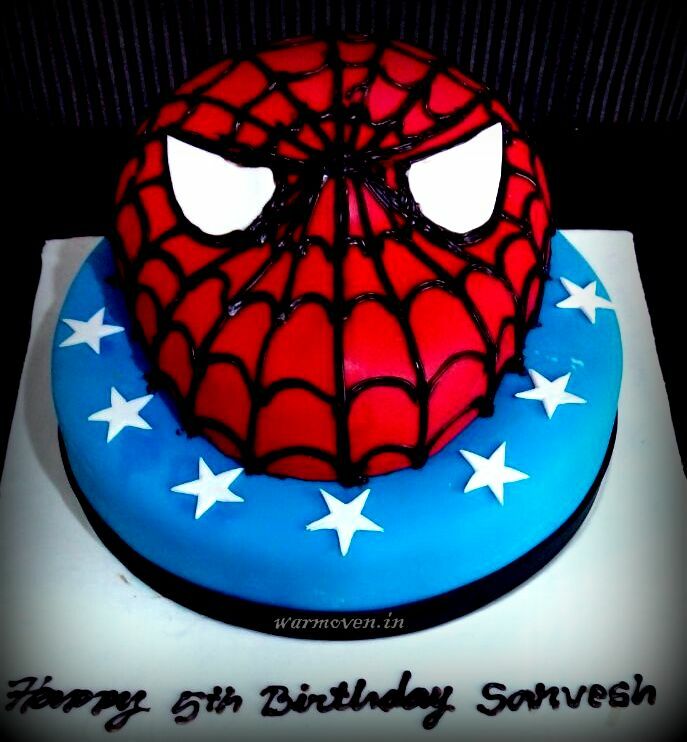 A striking cake depicting the Spiderman mask is one such. The cake is covered red fondant & the unique spiderman webbed pattern drawn over it with Spiderman’s trademark eyes. It makes a perfect cake for small parties which do not need huge elaborate cakes. The choice of the cake sponge is entirely up to the customers; select any flavor from the range of flavors available at WarmOven. For a Spiderman cake on a more grand scale, WarmOven has a magnificent tiered cake with an imposing Spiderman topper. The cake sponge can be made in different flavors of your choice and the cake will be covered with handcrafted fondant motifs keeping the Spiderman spirit alive. Choose from the below Spidey Cake designs today & let your little boy experience that super human power while making his birthday wish! !